Do your carpets look so bad that you are considering replacing them altogether? Perhaps you are considering spending hundreds of dollars by hiring a professional carpet cleaner to clean your carpets. Instead, why not follow the carpet cleaning techniques below which are not only inexpensive but simple and effective as well? For starters, you should not rub in any spots that you notice on your carpets, as this will only spread the soil around. Instead, any wet spots should be taken care of via blotting. Carpets can also be cleaned by using a mineral spirit product that is mild in nature, and dry spots should be eliminated by first loosening the soil followed by vacuuming the loosened soil. You should follow the two steps above before moistening your carpet when dealing with dry spots. Furthermore, a carpet that is cleaned with a cleaning solution should always be rinsed meticulously: This is because cleaning products can sometimes attract dirt, so it's always best to rinse thoroughly after cleaning your carpeting with a cleaning product. Stain removal should also always involve using a piece of cloth that is white, and stains and spots should be taken of as soon as possible: This is because the chances of removing said stains and spots increases exponentially if they are eliminated while still fresh. Also, please follow the directions on your cleaning product, ensuring to dilute as directed. That is, a cleaning product that has not been diluted sufficiently may exacerbate existing carpet damage. It must also be noted that some stains cannot be removed no matter how hard you try and you should always pre-test your carpeting before you attempt a full blown cleanup job. A good way to do this is to apply some of the product to an unobtrusive part of the matching material and then wait for about 10 minutes. If the color of the material transfers over to your towel hen it is a telltale sign that you need to use another cleaning solution. Carpet stains on your floors can be a huge mess and headache for you to remove. Learning some new techniques can make things much easier. Here are some carpet cleaning tips for removing tough stains and hopefully they will allow you to keep your carpet cleaner. Kids can wreak havoc on a rug, but so can an adult who is not paying attention. If you stick to these rules, your rugs will stay clean. Some of the hardest spots to get rid of are ones that are protein based. Blood stains are hard to get out of a rug. If you are lucky, some cold water will lift the spot right out. But, for a bigger stain, it is almost imperative to call a professional in because they have the proper machines and chemicals that will take care of a protein based stain. Luckily, most household rug spots are not so daunting. Wine and dark juices are hard to clean from a rug because of their dark colors. But if you take care of it as it happens, using a cloth that is clean and wet down with cold water will work. 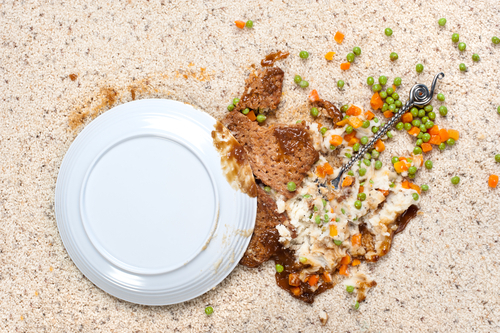 Try to take care not to rub too hard, because the spill will just permeate into the fibers of the rug. A gentle dabbing will almost always be sufficient, and you will not do any damage that can not be fixed. Things that get stuck to the nap of your rug, such as gum and sticky candy are easily removed by using cold water and a gentle hand to lift them off the rug. Sometimes they will leave a bit of a spot behind; using some soda water and using the blotting technique will repair any damage the sticky things may cause. There are also many commercial products on the market to deal with pesky rug blemishes and messes. These carpet cleaning tips for removing tough stains will ensure that you retain your beautiful floor covering for years to come. Tips that can help homeowners keep their carpets well maintained between professional carpet cleanings. 1. 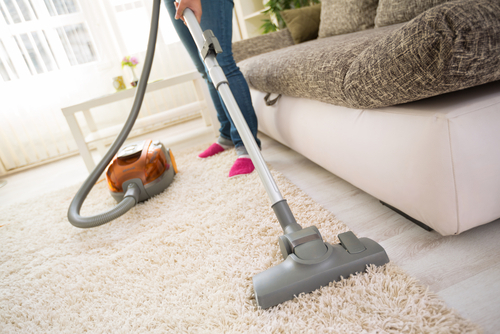 Vacuum Regularly - carpets should be vacuumed no less than once a week (more often in heavily trafficked areas). Routine vacuuming extends the life of a carpet by simply preventing the build up of dirt particles that tear down carpet fibers. The height and texture of a carpet will also determine how much care it requires. Carpets with shorter piles are more low maintenance and a wise option for individuals with busy schedules. Carpets with longer piles are softer but will demand more attention. Thus, how often someone should vacuum is contingent on the type of carpet, as well as the amount of foot traffic it receives. Creating a vacuum schedule is a clever technique to remind household members to be proactive in cleaning the carpet. Household size, type of carpet and foot traffic determine how often the carpets should be vacuumed. A schedule placed on the fridge can serve as a friendly reminder. 2. 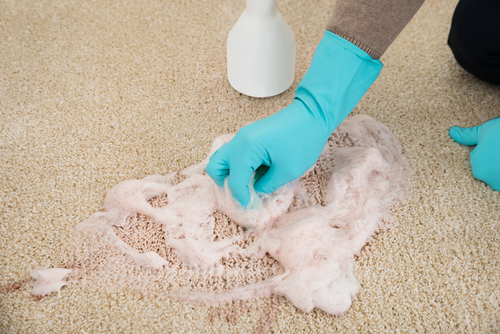 Be Cautious When Removing Stains and Spots - Carpet stains pose a serious challenge when cleaning house. Before attempting to remove a stain consult a professional carpet cleaning company for advice. Harsh chemicals can cause further damage to the carpet's fibers. Also, scrubbing a spot can cause the spill to be pressed deeper into the carpet pad. The remedy for removing a spot or stain is dependent on the spill. Each spot will require a unique method for removal. Consulting a professional is a smart option to avoid additional damage to the carpet. However, immediately after any spill, the recommended technique is to gently blot the spot with a clean cloth. 3. Avoid Using Carpet Deodorizing Powders - Contrary to popular belief, carpet deodorizing powders do more damage than good. This talcum powder is not water-soluble and can be a challenge to remove. Later when the carpet is professionally cleaned, the deodorizing powders will rise to the surface once the carpet has dried. This leaves the carpet looking dirty and may also cause a white stain. Also, many of these powders contain harmful chemicals that are dangerous to inhale. Allowing a professional to remove stains and odors is the safest and most efficient method. 4. Invest in a High-Quality Carpet Pad - Just as houses need strong foundations to remain intact, carpets need quality pads to maintain longevity. Many people purchase inexpensive pads to save money, however, cheap pads cause carpet fibers to breakdown more readily. If the carpet is not supported by a strong foundation, wear-and-tear will happen exponential faster. The upfront investment of a quality pad will save the consumer money in the long run. 5. When in Doubt, Call the Pros - Professionals have developed proven, efficient, and cost-effective methods for cleaning carpets. A trusted professional can provide a multitude of benefits to the consumer.